Its that al fresco time of year again! There’s only one thing to do when the child’s last hour of creche is spent in the sandpit and thats keep him outdoors until the bath is run. 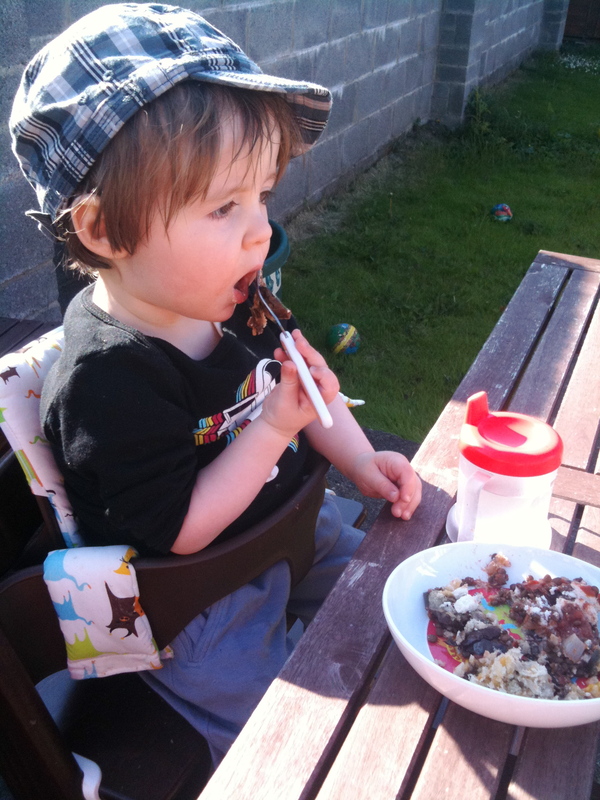 Dominic’s grasp of cutlery has vastly improved. And boy does he not want my help anymore. So with our ‘spell’ (eh, 2 days so far) of good weather, I decided that we could take the mess outside. I was alerted to a fantastic veggie blog recently by Donal Skehan on Twitter. It’s called Veggies and Me written by an Australian woman living in Dublin. The food photography is gorgeous, and I really like the perspective of a vegetarian Australian living here. I plan to make Chargilled Veggies, Chickpea & Halloumi salad and After workout Breakfast eggs (except without the early morning workout) but this week I tackled the Eggplant Parmesan with Lentils. As Megan points out, this is a little time consuming and might make a good weekend dish. However, I prepared and assembled it after pilates one night, while baking sweet potato wedges and a sneaky quorn escalope in the oven for that evening. Then we popped it in the oven the following evening and had a couple of nights out of it. I’m not sure of the authenticity of the name, as there’s not a bit of parmesan to be seen, but I’m sure you could sprinkle the veggie kind on there. Lentils were a great touch I have to say – it really made the dish unrecognisable from the dense chewy comfort food version that husbag has dished up in his day. We’ve argued long into the night about the idea of ‘too much mozzarella’ existing. I think you can have too much, he doesn’t, but we can hash that out for ages. Whether this recipe sticks to the brief or not (I’ve checked there’s a lorra lorra eggplant parmesan recipes out there, each one slightly different) it’s a fantastic family food. Ah I’m delighted to find a good veggie blog, especially a local one!